Well, hello there! We're Morgan Harper-Nichols and Jamie-Grace Harper. We're sisters, artists, and creators. This site is the place where you can find everything made by us, everything made for you. Born February 4, 1990, Morgan is the oldest of the Harper Sisters. She is a writer, visual artist, and music recording artist. She is an award winning songwriter professional vocalist who has performed on several Grammy nominated projects, including her sister's debut single "Hold Me." Her debut single "Storyteller" is played on radio stations around the world and has reached over a million plays on Youtube, Spotify, and other platforms as well. In addition to music, Morgan is a full-time writer, visual artist, and graphic designer. Her first book of poems, released December 2017 debuted at #1 on Amazon in Inspirational Poetry. She is the founder of projects such as The Devo Co, The Binder Co, and The Storyteller Co. At Harper Sisters, you can find Morgan dabbling in all things writing, singing art direction, digital media and communication, videography, photographer, and music composition...and making several references to getting more coffee. Born November 25, 1991, Jamie-Grace is the youngest of the Harper Sisters. She is a writer, producer, director, and 2x Grammy Nominated and Dove Award Winning recording artist. 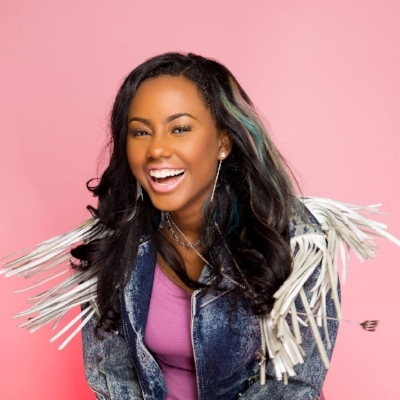 But even with several number one singles and thousands of concerts played around the globe, Jamie-Grace is most known for being the girl with the guitar who loves to make things to help other people smile. She has produced and directed several music videos, lyric videos, and short films, and is the executive producer on her third studio album entitled '91.' Jamie-Grace has been featured on The View, Good Morning America, Inside Edition, and numerous other networks and publications for music. She is the founder of the organization I'm A Fighter which highlights the stories and resilience of those who have are fighting various health battles. Jamie-Grace has Tourette's Syndrome and has been an outspoke advocate for awareness for over ten years. At Harper Sisters, you can find Jamie-Grace working in all things writing, art direction, music production and composition, comedy sketch writing, and lots of random bursts into obscure Broadway show tunes.